Bread is all for the majority of families in Uzbekistan. Hearing statements about "grain independence" of the country, the population encounters shortage of dough and prices it can barely afford. 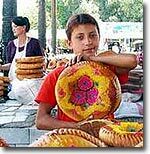 Whoever in Tashkent fails to buy bread in the morning finds buying it in the afternoon a trying task indeed. Local analysts attribute shortage of grain and dough to the practice of write-ups in accomplishment reports, just like in the USSR once. The actual yield could be - and apparently was - far below what was reported with pomp (about 4 million tons instead of the officially reported 6 million). Discouraged to deal with grain by low purchasing prices, farmers and peasants brought to the silos financial equivalent of their crop quotas. Some of them bought wheat at bazaars and brought it to silos at a great loss to their own budgets. Sale of other crops more than covered all these expenses. The authorities know all about these operations but turn the blind eye to them to be able to make a glowing report to their own superiors. In short, falsification of reports is not an evil that plagued the USSR alone. It is a commonplace practice in Uzbekistan these days. 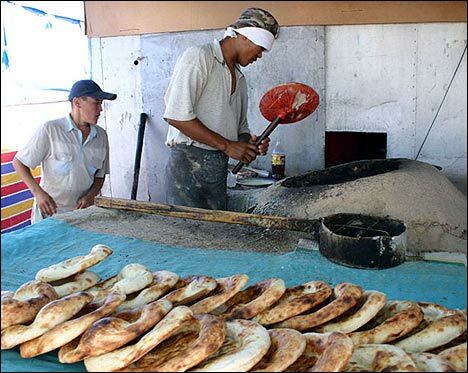 Kazakh dough prices nearly doubled not long ago, and that is another cause of the problems with bread in Uzbekistan. This dough is mostly smuggled into Uzbekistan. Made of durum wheat, it is quite popular with Uzbek bakers and housewives. A loaf of bread (of poor quality but quite popular all the same) costs 200 sums now against 175 sums several days ago. (The state is keeping the price down by artificial means.) Sources in Ferghana tell this news agency that even cakes are sold at double the previous price (300-800 against 150-300 sums depending on kind). Patyr-nons (the largest cakes) go at 1,500 sums or $1.2. Ferghana.Ru stringers in Karakalpakstan claim that loaves of bread sold nowadays are smaller in size and weight but at the old price. Customers are compelled to recompense local bakers and sellers for their losses. Shortages and higher prices are not restricted to dough and bread alone. Reports from the capital of Uzbekistan are somewhat contradictory which is probably the best proof of their authenticity. Source say, for example, that vegetable oil disappeared from nearly all stores in Tashkent. Whatever stores do sell it doubled its price. "A 5-liter canister costs 18,000 sums at bazaars - against 7,500 sums a couple of days ago," one source said. "People queued for cotton oil at bazaars all August. Price of dough soared from 400 to 1,100 sums overnight. Bakers say they will close down soon because nobody can afford cakes that expensive..." another added.